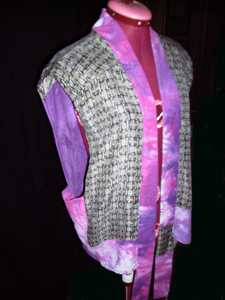 My clothing creations vary from long coats to comfortable jackets to coordinated outfits. This particular garment is done in Tencel, a unique man-made natural fiber, which is as soft as Rayon. Most garments are not form fitting, but rather allow you to move with ease. Review our gallery of garments that we have created for your own inspiration requests. 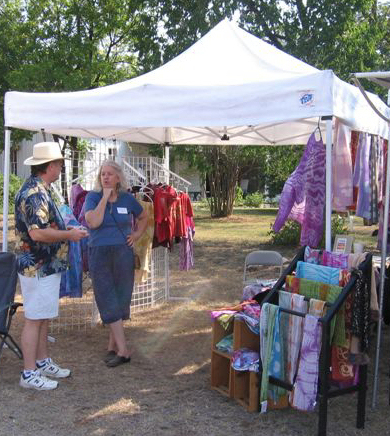 We teach primarily Batik and various kinds of Shibori dyeing formats. Included in the class are the basics of setting up a dye bath or upon request an indigo dye bath. A fun thing that many students do is bring a garment with them that they love the pattern. As a part of the class we will discuss how the pattern was created! All of the festivals are somewhere in Texas. We hope to see you at our booth in the near future. Keep in mind that we also do custom orders, so if there is something you are interested in please let us know. Finally arrangement can be made to visit our studio outside of Dripping Springs and look at our current creations! If you are interested learning a technique I use, check out the workshops page.